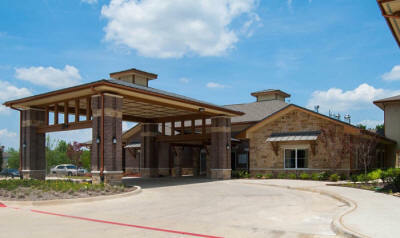 Combining the warmth of home with wonderful amenities and compassionate care, Cedar Bluff Assisted Living and Memory Care in Mansfield, TX looks forward to serving your family. Our community offers seniors a vibrant lifestyle that encourages health and independence through our industry-leading educational, health and wellness programs. We’re fond of saying that every day at Cedar Bluff is like a reunion of good friends and family. It’s that approach to life that makes living in our community so special. Cedar Bluff offers an exceptional residential environment with a vibrant lifestyle that encourages health and independence through our industry-leading educational, health and wellness programs. Cedar Bluff offers Memory Care services in comfortable surroundings, where Residents can enjoy our exclusive Symphony of Life® daily lifestyle experience. Our unique approach orchestrates our entire community to surround our Residents' needs and builds upon their strengths, allowing them to live to their fullest potential. Uniquely tailored to meet the individual needs of Residents, our Assisted Living offers minimal to round-the-clock care. Whether the need be with personal daily living activities (such as bathing and grooming) or with issues such as medication assistance or incontinence needs, the compassionate, trained staff at Cedar Bluff Assisted Living and Memory Care is always available. Ensuring the core objective of each Resident's peace of mind, our Assisted Living options include upscale and fully-equipped private apartments, a full and varied activity calendar, gourmet-quality dining, and a maintenance and worry-free lifestyle. We offer all the care and assistance you need to take full advantage of the Cedar Bluff experience. While healthy meals are an integral part of wellness, it's about more than the food. But the truth that accompanies this is that in our golden years it may become harder to prepare those meals. It may be very difficult to get to the grocery store and transport the purchases home. Mealtime may have lost its joy due to living alone and having no one to share it with. Or one may just lose the enthusiasm for the work involved with preparing meals all day long and the endless clean up involved. Worry not... at Cedar Bluff Assisted Living and Memory Care, it's all taken care of! Making use of one of the finest chefs in the region, we provide restaurant-style gourmet quality fine dining. Our professional staff members do the planning, shopping, cooking, serving and cleaning. You'll never have to worry about washing and drying again! In addition to a varied menu of three meals per day, including daily chef's specials and some standby favorites, we provide snacks for anytime you need a little boost! 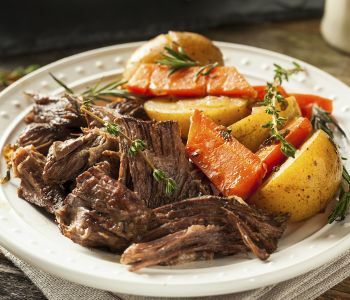 Our varied menu allows for specialized dietary needs, and is flexible enough for any input you might have. Whether it's your aunt's fried chicken secret or your own custom chili, share your favorite recipes and bring a taste of home to the table. Respite Care provides temporary relief for caregivers and family members caring for people with disabilities or special needs. Respite Care can also be employed to allow for recovery after a surgery or hospital stay. That's where Cedar Bluff Assisted Living and Memory Care in Mansfield can help. Respite Care from Cedar Bluff provides short term breaks that relieve stress, restore energy, and promote balance. Caregiving is a demanding, difficult job, and no one is equipped to do it alone. Having support is as essential to the health and well-being of the caregiver as the Resident. Cedar Bluff can help absorb the challenges of daily caregiving with resources and planned Respite Care. Using our services can help to sustain a family caregiver's health and delay out of home placements. You can enjoy peace of mind knowing that your loved one is well taken care of at Cedar Bluff Assisted Living and Memory Care. Contact us for additional information. Cedar Bluff is Pet Friendly! Pets are a welcomed part of the family at The Springs. 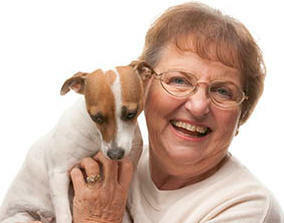 Our community allows cats, small dogs, birds or fish, at the discretion of management. Contact us today to learn more or for specific questions. Our staff looks forward to serving your needs and to introducing you to all that Cedar Bluff Assisted Living and Memory Care has to offer its residents. For more information about Cedar Bluff Assisted Living and Memory Care, please call (817) 225-2468, or complete our Request for Information Form below.